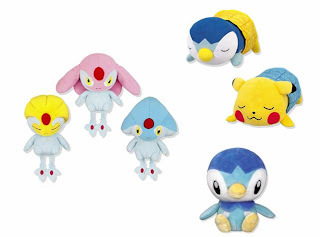 5 New Pokemon plushes, Horsea, Bellossom, Tropius, Piplup and Pachirisu will be introduced by Banpresto in June. Size is approx. 5.5-6" height, game prizes, "Tropical" version. 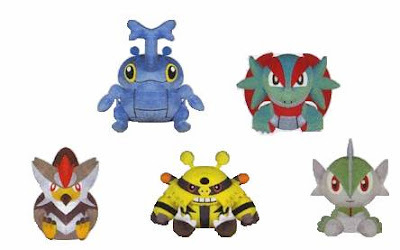 5 New Pokemon plushes, Heracross, Salamence, Staraptor, Electivire and Gallade will be introduced by Banpresto in April. Size is approx. 5.5-6" height, game prizes. 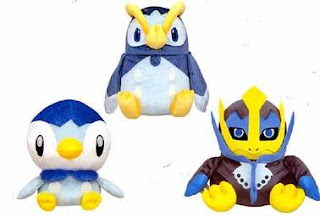 New Pokemon plush, Piplup, Prinplup and Empoleon will be introduced by Banpresto in April. Size is approx. 10" height, game prizes. I sometimes review the keyword what my blog visitors are looking for. Recently the keywords that keeps popping up at AllAboutPokemonFigure are Giratina and Regigigas. Here is release summary for figure/plush of Giratina and Regigigas. 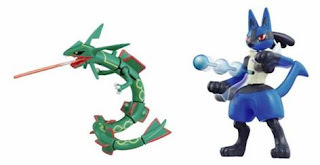 Pokemon battle action figure Rayquaza and Lucario will be introduced by Tomy at 21 February. Size is approx. 9.8" height, having many gimmicks. So far Torterra, Infernape, Empoleon, DialgaPalkia have been released. Regigigas and Giratina will come in April and June. 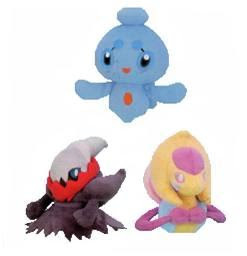 New Pokemon plush, Cresselia, Phione and Darkrai will be introduced by Banpresto in March. Size is approx. 5.5-6" height, game prizes. New Pokemon plush, Gligar and Riolu will be introduced by Tomy at 21 Feburary. Size is appox. 11". 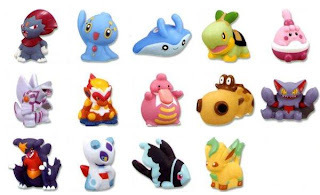 The following new Pokemon plush are introduced by Banpresto in January. These are game prizes. Bandai Pokemon Super Get Series 1 to 15 will be covered 105 Pokemons and full completed except for Shaymin Arceus by March. Best selection series SP01 will out in April. Clear version also will be available. Pokemon new 11th movie will be released at 19 July in Japan. Title : Giratina and Icy Sky Bouquet (English title is not fix at present). Now location scouting is going on at Norway. In this movie, Regigigas is being one of main Pokemon. 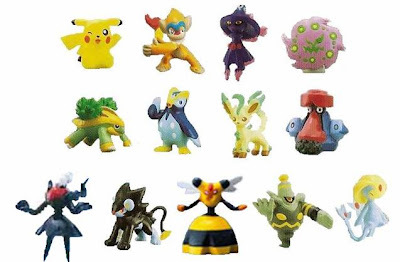 As for relational goods, Tokyo Toy Form 2008 was held at 15/16 January, Regigigas plush and figure are introduced in Tomy booth. Will come in the market around middle of May. Tomy will renew 3 figures, Ivysaur, Charmeleon and Wartortle on 21 June. As for other renewal figures, please refer to search result. In this month, no DP series from Tomy. 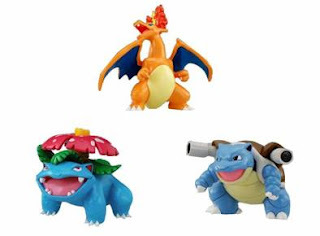 Tomy will release 3 Pokemon figures in Battle Scene series, Venusaur, Charizard and Blastoise are dynamic pose at 17 May. As for other Battle Scene figures, please refer to search result. 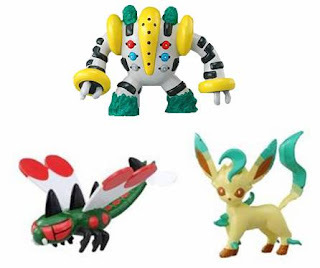 Tomy Monster Collection Series will release 3 figures of Pokemon DP at 17 May. Updated summary list of released figure, refer to Pokemon DP figure release summary. 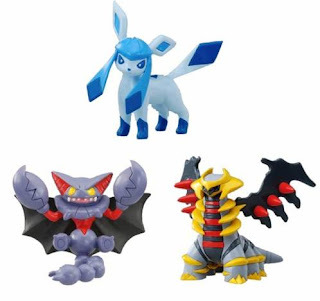 Tomy Monster Collection Series will release 3 figures of Pokemon DP at 19 April. Will post the photo later. Updated summary list of released figure, refer to Pokemon DP figure release summary. Oh this month is 'G' series. Giratina (Normal form) will be released in May. The following photos are uploaded. 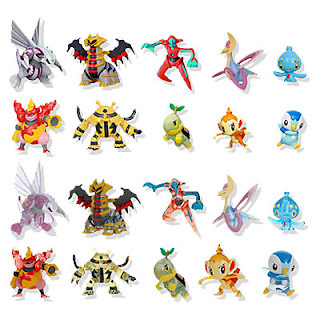 Bandai Pokemon Kids series DP7, will release 14 figures in April. Updated summary list of released figure, refer to Pokemon DP figure release summary. Palkia is the new pose. Photo for Bandai Pokemon Super Get Series 13, figure release in January is uploaded.